Louis Feinberg, better known as Larry Fine was an American clown and comedian, who is best-known as a member of The Three Stooges. Larry Fine was born Louis Feinberg in Philadelphia, Pennsylvania, at the corner of 3rd and South Streets. The building there is now a restaurant, and it houses a small Three Stooges museum. As a child, Larry’s father was a jeweler and kept acid in his shop for testing the authenticity of metals. Young Larry burned his arm with some of this acid, resulting in the need for physical therapy to strengthen his damaged arm — at the time, that therapy was learning to play the violin, which led to his early introduction to performing. As Larry Fine, he began performing as a violinist in vaudeville. In 1925, he met Moe Howard and Ted Healy. Moe and his brother, Shemp, had been working as audience stooges for Healy, and Larry soon joined the act. Ted Healy offered him a salary of $90 per week, with an additional $10 if he would drop the violin. Larry always played the middle stooge with a receding hairline and bushy unkempt hair, acting as the straight man to the other, more ‘extreme’ stooges. Shemp left soon after to attempt a solo career and was in turn replaced by another Howard brother, Jerome, aka Curly. Larry Fine married Mabel Haney were married in 1927. The marriage resulted in two children, his daughter Phyllis Fine, his son John. Beginning in 1933, The Three Stooges made more than 190 short films, and later several features. Their career with Healy was marked with disputes over pay, film contracts, and Healy’s drinking. They left Healy for good in 1934, with Moe signing a film contract with Columbia Pictures. Interestingly, Larry Fine signed a contract for the team with Universal — Moe’s contract was signed first, and invalidated Larry’s contract. Larry Fine consistently played the straight man, providing the voice of reason between the extreme characterizations of Moe and Curly. During his 40 year film career, he never appeared in a movie apart from the Three Stooges. 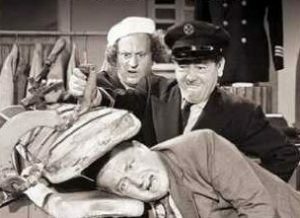 After Curly’s career-ending stroke, when Shemp finally had to replace Curly, Larry insisted that each member give $50 of their weekly salary to support Curly who could not work. Moe was deeply touched by this act of generosity to his brother. In a similar vein, Larry insisted that Joe DeRita be made an equal partner in the Three Stooges, whereas Moe wanted to make him an employee. Larry reportedly threatened to quit unless Joe was treated fairly. With the dawn of television, the market for short films became less profitable, leading to the seeming end of their film career. However, Columbia sold their library of short films to the new medium of television, causing the Three Stooges became a big hit to a new generation in the 1950s on television, which revitalized their careers. Larry Fine’s wife, Mabel, died in 1967. He then lived at the Knickerbocker Hotel in Hollywood until 1970. Larry then moved to the Motion Picture House, an industry retirement community in Woodland Hills. Larry Fine died there at age seventy-two of a cerebral hemorrhage. He is interred in the Forest Lawn Cemetery, Glendale, in the Freedom Mausoleum, Sanctuary of Liberation. The Three Stooges have a star on the Hollywood Walk of Fame for their contributions to Motion Pictures at 1560 Vine Street in Hollywood. Thanks for putting this together, but there are some minor inaccuracies. Larry joined Shemp and Ted Healy in 1928, not 1925. Larry’s son was Johnny, not Warren Wolf. Their first short was in 1934, not 1933. You did a very nice job overall though and thank you for keeping the Three Stooges memory alive.